When it comes to buying and selling mortgage notes the seller and note broker want the same thing… the best possible price! That makes it tempting to blast out a quote request worksheet to every note investor in the directory. But wait! Consider the flip side before you hit that send button. A note buyer’s first concern is to make a fair return and be sure their investment is protected should the monthly payments stop coming in. They would love to be the only game in town, but they know there’s competition. So they balance competitive pricing with yield and safety. The investor is happy to make offers, however they do NOT want to waste their time and money on a multitude of quote requests they will never see as deals. That means the “shotgun” approach, faxing or emailing a transaction to 8-20 investors on auto dial, is highly discouraged. Seeing a deal that has been broadcast to the entire note investor world gives the sender an unfavorable reputation. It can also drive a credit score down if a large number of note buyers start pulling a report. This in turn can pull the price down. What About the Listing Services? Registering the deal on a note listing service is pretty much the same as faxing it to 20 or more investors. Plus, many of the people making offers might actually be other note brokers themselves. Whenever possible get direct with the investor. Ok, so now we’ve put down the shotgun. How do you find the best offer knowing that quotes can sometimes vary by thousands of dollars, especially depending on an investor’s preference? Having been on both the buying and selling sides of cash flow notes for over 20 years, we suggest a targeted approach. First, talk to the seller and verify the information on the analysis worksheet. If possible, get a copy of the note, closing statement, and mortgage or trust deed. Next, pull out your list of note investors and start matching the transaction with three mortgage buyers you believe to be best suited to the deal. This should be based on research of their preferred parameters including property type, location, equity, seasoning, credit scores, and documentation. Now submit the quote request to three targeted investors that were a top match. If the quotes meet the seller’s expectations you are in good shape. If not, then try the next 2-3 on you list. 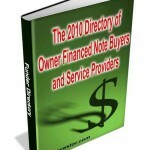 If you are searching for a list of note investors you might want to try the directory in the bookstore. You can also use an Internet search tool like Google. J ust know that it takes a lot of time, trial, and error to sort the real offers from the scams. It’s always nice to have reliable short cuts. The updated directory is like having access to our personal Rolodex of note buyers. Click here to grab your copy and we’ll throw in the 21 Secrets Report for free! I have a company where I will finance my customers into buying our product. I would like to sell that note that we create to someone for the up front cash. Do you guys know the best place or person I can sell these notes to? I have a colleague who has an unsecured note being paid to his company from a former partnering company. It has 30 more months of $1500 payment at 10% interest. He would like to convert to cash now. 2) Find a local private note investor that might consider an unsecured note purchase. They might consider a partial purchase of the next 8-12 payments.